If you live in Metro Manila, there’s one place you can go to for a perfect day trip this season: Wawa Dam in Montalban, Rizal, which is just an hour from Quezon City and two hours from Manila. 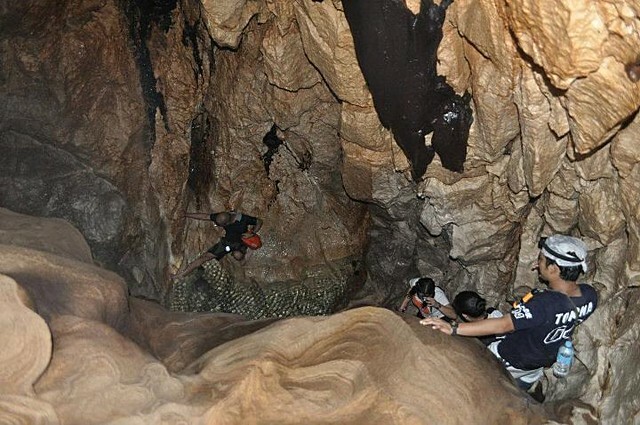 You can go swimming there, rafting, trekking, biking, and yes, for the more adventurous, you can even go caving. Wawa has a number of cave and cave-like formations. In the Second World War, its caves were even used by Filipino revolutionaries as a hideout. 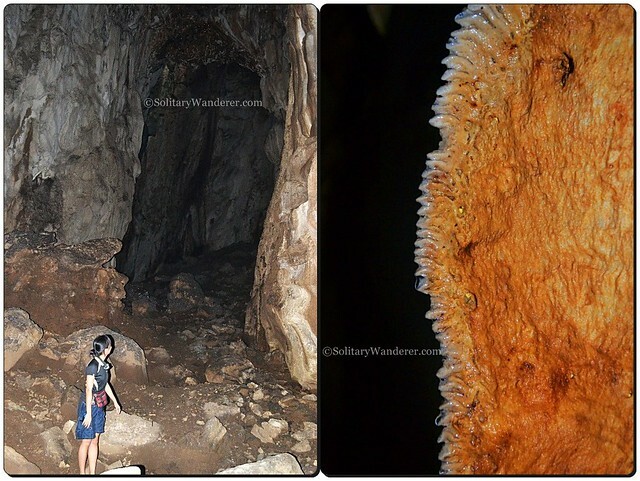 There are a few open caves for spelunking, and two of the most interesting ones are the Bat Cave and Pamitinan Cave, which I explored with the help of guide Marc Gana. 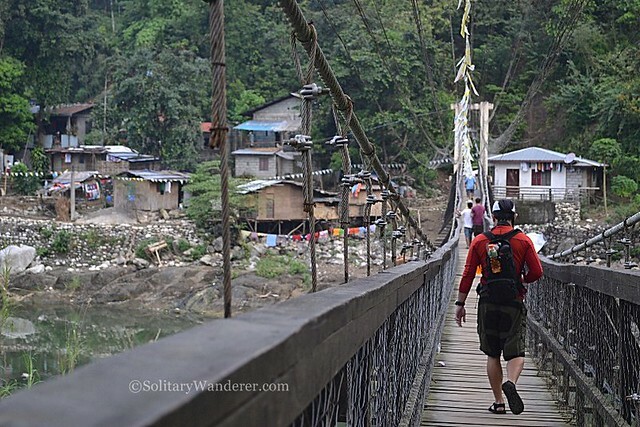 From our meet-up point in Aling Norma’s eatery across the Wawa Barangay Hall, we crossed the hanging bridge and hiked around 20 minutes uphill to go into the entrance of the Bat Cave, so named because–you guessed it!–it has so many of those nocturnal creatures inside. The wooden hanging bridge in Wawa Dam. 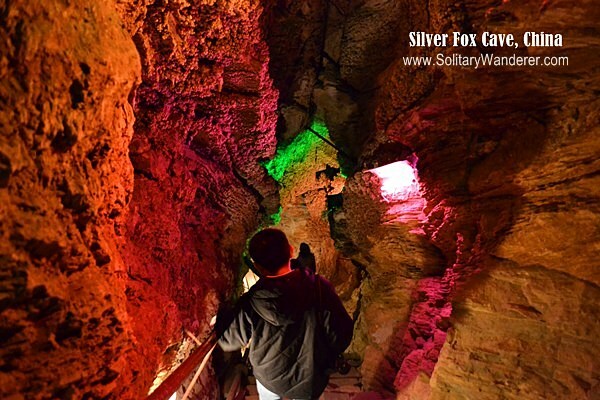 The moment we entered the huge entrance (reminiscent of the Bat Cave in Biak-na-Bato, Bulacan), we could see (and smell) ample evidence of the bats’ presence. We had to be very careful in walking, because the ground and the walls were littered with all kinds of creatures, from ants and spiders, to (yuck!) hundreds of cockroaches who all feed on the bat guano. 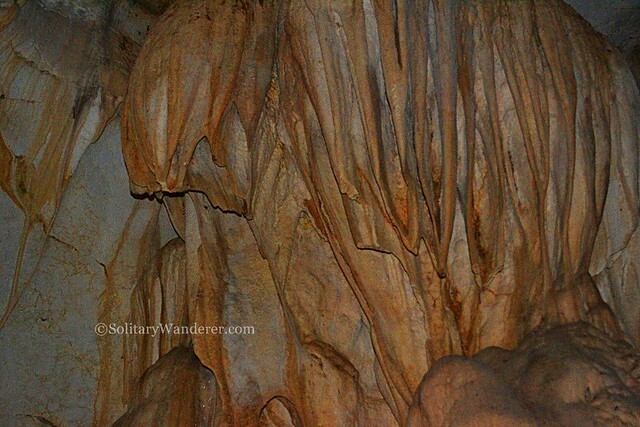 While Bat Cave didn’t have a lot of the spectacular rock formations I’ve seen in Sumaging (Sagada), Cantabon Cave (Siquijor), or Danakit Cave (Tandag, Surigao del Sur), it does have its share of interesting features. 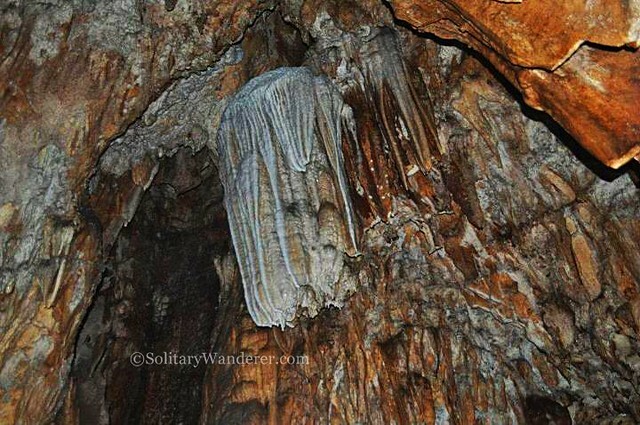 There’s a teeth-like rock formation, some nice stalactites, bat bones, and two human skeletons. Entrance to the Bat Cave and some teeth-like formation inside. Lovely stalactites inside the Bat Cave. 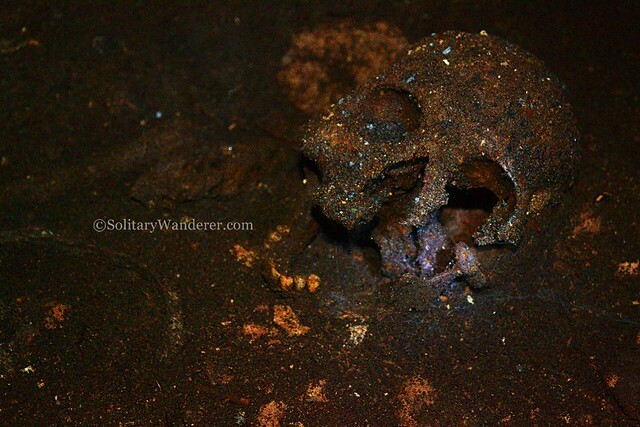 The skull of an unidentified human inside the cave. Yes, in one of the chambers of the Bat Cave are two adult human skeletons, their bone fragments almost complete. They were placed just a few meters apart, and according to the guide, why they were there or who they were remain a mystery. Were they lovers who killed themselves, or is it a case of murder? Nobody knows, but until now their bones remain there as a reminder of how fragile our lives can be. Lesson learned: when you do a river crossing, make sure that you tie your dry sack carefully. Even better, bring a waterproof or underwater camera with you! In any case, the Pamitinan Cave is huge. According to literature, it was the birthplace of the Katipunan, the place where the Filipino revolutionaries, led by Andres Bonifacio, uttered their first cry of freedom in 1895. Standing in the dark (my Petzl’s batteries needed to be replaced), I could almost feel the courage of those eight Filipinos who braved all for their country’s independence. Somewhere inside is the inscription Viva la Independencia Filipinas and there’s also a marker just outside the cave, in both English and Japanese, saying: Give them eternal rest, O Lord, and let them share your glory. There were quite a few people in the cave when we went there; not tourists though, but surveyors for some reason or other. We easily passed by them and followed the long passageway (which could accommodate a train!) which was criss-crossed with plastic pipes bringing fresh water to the residents of Barangay Wawa. 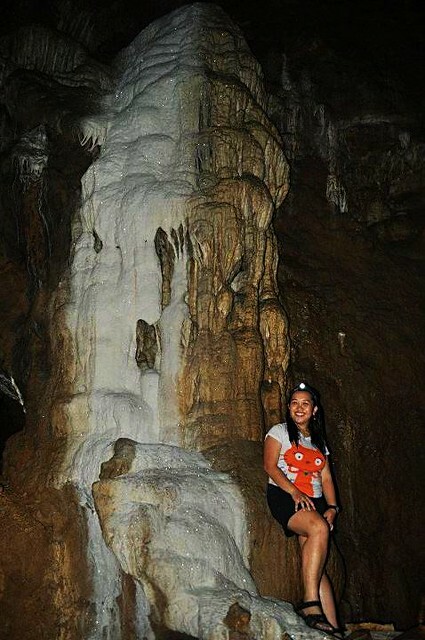 Beautiful stalactites inside Pamitinan Cave. 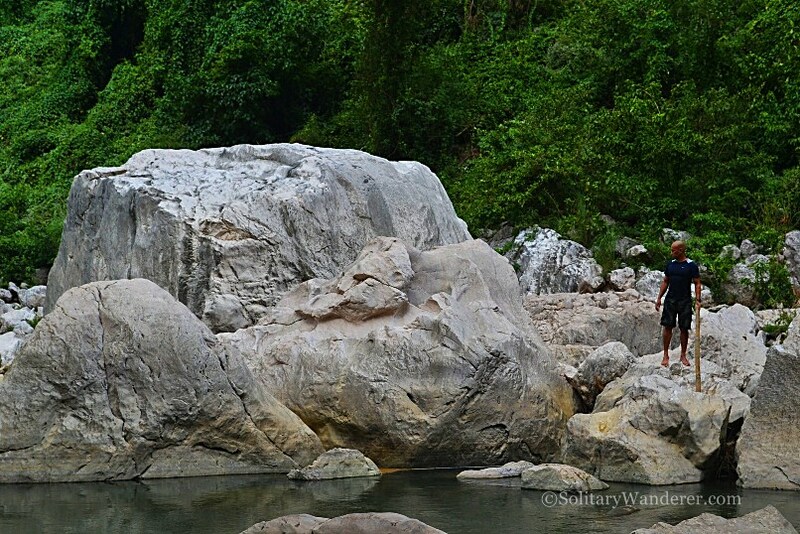 Even though we didn’t explore as many chambers, Pamitinan has a more enjoyable feature: it has a very cold pool with very clear waters which can be reached only by crawling and stretching your legs. 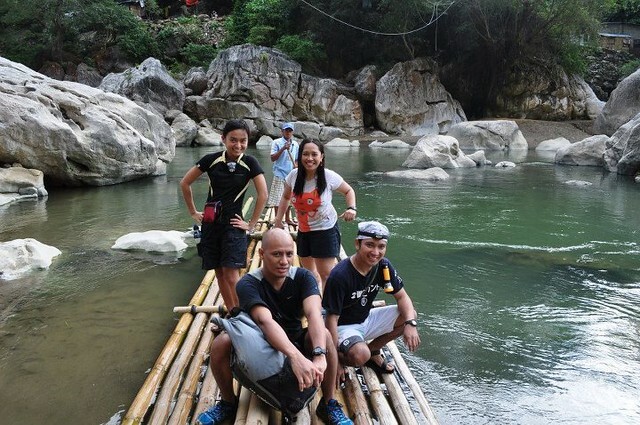 I was already quite cold from our river trekking so I opted not to take a dip. When we went back to the river, we saw the raft of the the surveyors, with a local man “captaining” it. He was generous and kindly, and offered to take us across the river for free. We were all wet, tired, and very sleepy from having spent a full day of excitement in Wawa Dam. However, there was only one thing in our minds when we were on our way home: we will definitely go back caving in Montalban again. From Cubao, Quezon City, take the FX vans bound for Eastwood parked in front of either Tropical Hut or in front of Jollibee, in Farmer’s along EDSA. One way costs P50 each. Once in Eastwood, take the jeepney bound for Wawa or Yagit for only P8. For guides, contact the Rodriguez Tourism Office at any of these telephone numbers: (63 2) 997-9931; 941-1295; 941-1338; 941-0724 local 23. @ Nikki: Will do a post later on rock climbing in Wawa Dam 🙂 Don’t forget to check out my other posts on Montalban! @ Chris: Yeah, para syang nag-pose talaga. Laki ng boulders ano? @ Killerfillers: Yeah, it’s so near! It looks like good to see this place..Thanks for sharing with us..
Akalain mo meron pala nito malapit sa Manila. We’ll definitely try caving soon. @ Helen: Yeah, getting into a cave can be scary at first. Everything’s so dark and there are a lot of creatures there. But once you get over it, you’ll really like it! @ Gay: Nope, they cancelled that. I went with another adventure group, the TEAZone. Wawa’s caves are not as spectacular as the others I’ve seen so far, but at least it’s very near. Is this the Couchsurfing thingy or separate trip? Bet ko yang spelunking! Sana makasabay ako with some group. I never tried getting inside a cave before. I remembered being forced to join the adventure yet my wild imagination just prevented me from pushing through. Come to think of it, the insides o the cave is not as scary as I have imagined. It is actually very beautiful and fascinating. I would not miss the chance next time. Wow these place was great.Gonna visit there and have some adventurous travel. @ Josiah: You can do a lot in Wawa. Next time I may try rock climbing! The cave looks nice. I’ve been looking for a weekend getaway na malapit lng. This post sounds perfect! 🙂 THanks! i appreciate the way you gave details on how to get there. It makes me really feel it is possible, and I just might go. Thanks, too, for the tips on the guides. @ Sen Alonso: There are a lot of jeepneys going to Wawa passing by Eastwood kaya tayo ka lang dun (opposite direction ng mga jeep na going to Cubao). Madami ring trike na papunta pero cheaper of course ang jeep. jeep going to wawa. salamat! @ Mitch: Yeah, its proximity to Manila make it the perfect day trip destination. There are so many things you can do there, and since there are a lot of trees, you’d surely escape the summer heat! HUWOW! I didn’t know that there are such creatures and cave in Wawa, Rizal. These caves are within the area of Wawa Dam? Aside from beach, this is just perfect to those who wants to unwind. Very near sa Manila. Parang hindi msyado mainit unlike sa mga beaches natin sa province.